Arcade industry expert, Kevin Williams, editor of The Stinger Report, has outlined how the arcade industry still inspires the home console gaming and movie industries. Williams is quick to remind us that a number of amusement properties have been taken from the arcades and placed on the big screen in live action spectaculars, citing "a product like House Of The Dead that goes from a influential and popular gun game, to a number of sequels and finally it receives motion picture treatment. "For many in the conventional television, music and motion picture business the need to embrace interactive entertainment in their editing techniques, special effects and now in their storyline, clearly cites the impact that this medium has on other entertainment genres." The focus of Williams' presentation at this year's Edinburgh Interactive Festival will also be on "technologies in the public space such as touchscreen hospitality systems and 'exergaming'." 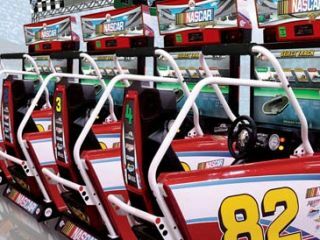 "At E3 this year there were a number of amusement machines on display," notes Williams. "The most noticeable was a back room presentation on the Capcom USA booth that saw three Street Fighter IV coin-op machines operated (and constantly in use by hungry players). "The importance of consumer feeding off of popular amusement titles can be seen in the efforts that Sega and Namco are placing into their respective 'Tekken 6' and new 'Virtua Fighter' fighting title launches." Arcade still beats out console, in Williams' view, who cites the example of "differences in the actual PS3 performance of Tekken 6, against the dedicated amusement hardware version. With the possibility of no new console hardware till at least 2013 the opportunity for amusement to push the envelope with performance is obvious." For many, the home console business took off with PlayStation in the 1990s, as a response to the perception of arcades being places of 'ill repute'. "This outdated misconception is tinged with a little bit of disdain about the closed-shop nature of video amusement...a number of writers in the console sector were shocked by the explosion in fan interest in 'Street Fighter IV's' [arcade] appearance," says Williams. "Attempts to write the arcade scene off as dead fell flat in the avalanche of player interest to play this coin-op (as well as with 'Tekken 6')." Check out the full interview for more on the future of the arcade. Stay tuned for more news and interviews from the Edinburgh Interactive Festival over the coming week.